Margaret Napangardi Brown was born c 1940 at Mandarine south west of Yuenduma, in a bush camp where she lived a traditional lifestyle. 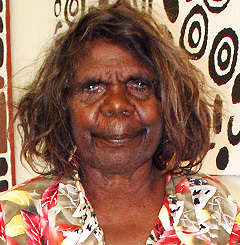 Margaret began painting in 1987 at Nyrripi. Her paintings feature bright orange or red backgrounds with iconic designs laid on top, and fine colourful dotting.